Hi friends, wow, this has been a busy week! 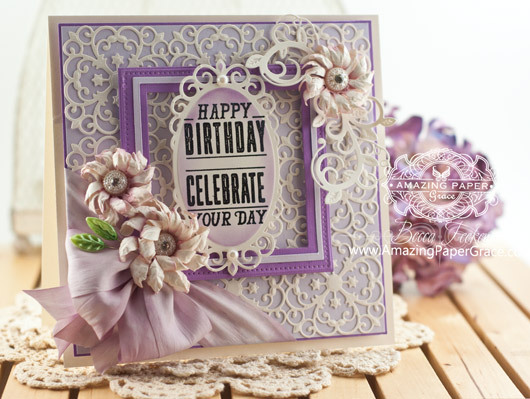 This week also marks a new release for JustRite Papercraft and today we’re sharing creations made with Stacking Sentiments and A2 Woodgrained Upcycled Frame Background Stamp. I zeroed in on the Stacking Sentiments and found there are so many ways to change them around to get a tall sentiment to your liking. 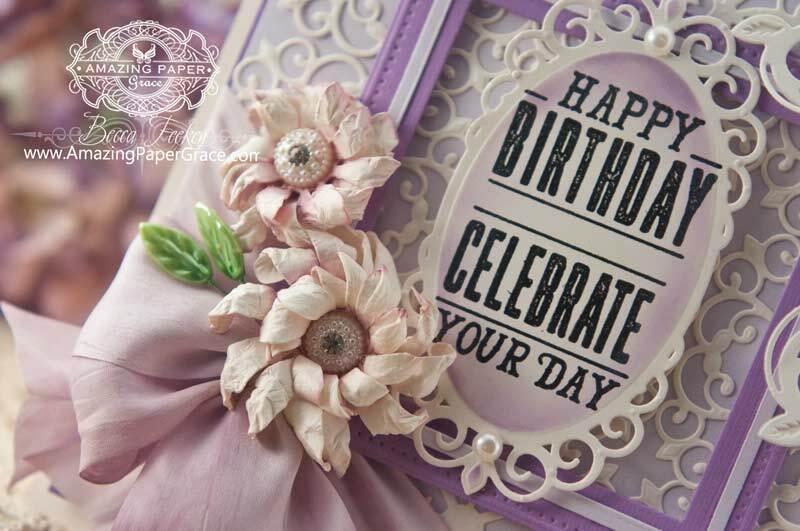 For my card today I created a diecut background using 9 of the center pieces from Spellbinders Victorian Medallion Three. To embellish I used Spellbinders Pierced Squares and added a smaller frame using Spellbinders Classic Squares LG, Spellbinders Classic Squares SM. Spellbinders 5 x 7 Mystical Embrace was tall enough to accommodate two of the stacked sentiments. I finished off with flowers made from Spellbinders Urban Blooms and embellished with Spellbinders Foliage Flourish. This card is a little larger than my norm, at 6-1/2″ x 6-1/2″ and will call for a custom envelope with my Envelope Punch Board. I love adding detail and textures with dies and it was so easy with the 9 cut pieces. Keep in mind that this, like my other designs, can be simplified. These are only suggestions but it’s very likely you already have squares and other basics like flourishes in your stash. I just have to say that this flower has become a staple in my repertoire and I make lots of them at the same time – you’ll see them popping up all over the place and many of you have asked for a tutorial – I’ll be adding that tutorial soon!! What are you working on these days? Cards, Scrapbook Pages? or something else crafty? I’d love to hear. 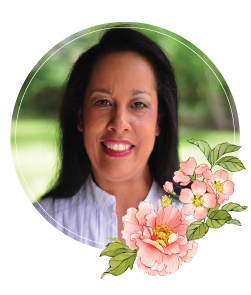 Thanks so much for stopping by and I have a romantic card with sweet words coming up tomorrow – I hope you’ll peek in to see. I’m still waiting for the Urban Blooms..not in UK yet! Love the colours and the whole layout of this card! Love how you have created such a beautiful background using the medallion three die. Just made such a yummalicious background!!! Thanks for sharing your creative eye with us. You are the “Queen” of die manipulation and such a fabulous asset to the Spellbinder world Becca. I know that I would not have turned into such a spellbinder junkie over the years, if it had not been for you sharing the oh so many ways to use each new die that comes out. And, I am positive that I am not the only one, but that there are a hundred plus behind me that also swear by Spellbinder dies due to your creativeness in using these dies. Warm hugs and much appreciation from this loyal long time follower. I was wondering what you had used for the beautiful decorative background, so lacy looking. Wonderful elements you have added, I love the beads in the center of the flowers, so pretty. Loving the sentiments too. So much ‘gorgeousness’ in one card. I adore this! So pretty Becca and I love the colors. I just finished 2 projects that have been on my table forever. They were inspired by Tim Holtz and just are adorable. Of course they will be for the next Christmas holiday season as they took way too long for the last one. Stunning Becca- what more can I say!! Morning Becca, A stunning card, especially the fabulous flowers. I would love to see a tutorial on those, they are so unique. What a stunning card. You are such an inspiration to all. Yes I would also love to a tutorial on the flowers. This is a stunning card, right up my street. I would love the tutorial on the flowers, you’ve made them look very real. Every card you make is a work of art.